Chic Being - BLOG-Visual content that sells premium brands - best practice beauty & fashion. Visual content that sells premium brands - best practice beauty & fashion. Visual content has been always crucial to connect with luxury consumers. Now, it has become the driving force behind commerce, too. Endless access to beautiful imagery has given the consumers a growing number of opportunities to discover desirable products in new online places: from mono and multi-brand stores, social sites and shopping apps to online publishers, and blogs. With “buy buttons” everywhere, consumers can now turn a shopping fantasy into purchasing action. In this new world of luxury retail every picture is a potential point of purchase, an opportunity to drive additional sales. Learn how to sell premium brand through visual content! With 400 million active monthly users and a feed that makes each piece of content the hero, Instagram has become a marketing and visual titan. In the flood of millions of photos, a sense of consistency in all the aspects of branding is even more important than ever. Making sure that the content follows the same rules for lighting, blur, colors, saturation, angles and filters is crucial to the success of the brand. Luxury brands who do the best in social media, are those who keep the content interesting, bold and different in terms of formats (photos and videos) and types of content: product photos, events coverage, User Generated Content, cooperation with influencers etc. Being open and inviting customers to the brand’s universe, taking them behind the scenes together with showing all the craftsmanship and attention to details during the process of products’ creation is what makes the luxury brands stand out. All these efforts should lead to increased interactions and customers engagement. Which brands are showcasing the best practice on Instagram? 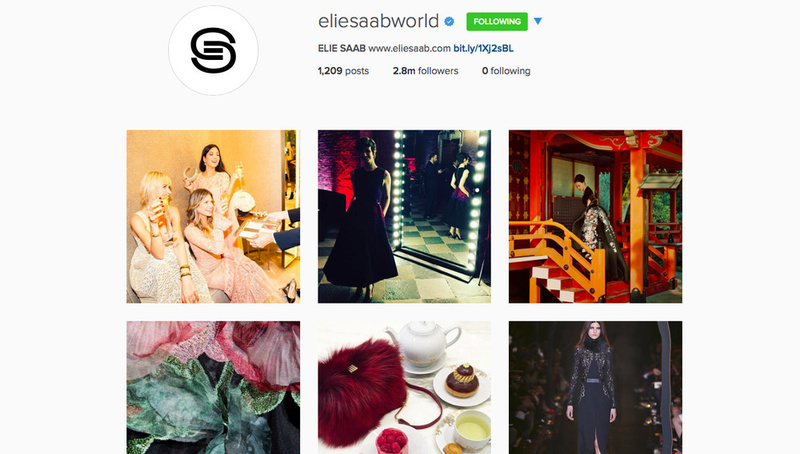 Elie Saab and Chanel for fashion industry, Anastasia Beverly Hills and MAC for beauty are the brands that took Instagram to the next level. At the beginning, Instagram was treated mainly as image building tool and a great way to interact with customers and build special relationship with them. But this era has already finished. Instagram started to become a tool to build sales as well. Currently, there are several companies and apps that are making it easier for followers to buy the things they see on Instagram. The biggest Instagram supporting company Curalate provides solutions to more than 700 biggest brands with the ability to both source and publish Instagram images at scale, while providing a direct path to products and content outside of the mobile channel. In 2014, Curalate launched its shoppable solution Like2Buy that has become an integral component of brands’ Instagram strategies providing galleries of products, available for purchase with just one tap. It enables to turn the customers engagement into revenue by providing a seamless way for brands fans to buy the products they love. In addition to driving traffic directly to the brand’s website, marketers are able to capture Instagram fans’ email addresses to grow the newsletter list and provide another marketing touch point. A make-up brand, for example, could send a recap of user-generated images featuring new look collection during a given week. That brand could also use that email to encourage new fans to share their own photos for a chance to be featured in future brand communications, or get a discount off their next purchase. Also, users can be directed to the homepage of the regional websites if the brand is operating in more than one country. The ability to sell through Instagram is growing significantly together with the number of followers for fashion and beauty brands. According to the latest report of Curalate, with data collected between September and October 2015, beauty marketers receive 95% of app’s organic reach and fashion marketers 98%. Fashion labels grew their communities by 27% accounting for 2 million new followers. Beauty brands’ communities increased by 30% with 600,000 new individuals. These results show extremely high potential for selling through this channel. The second biggest powerhouse of visual content is Pinterest. A lot of prestige fashion, beauty & lifestyle brands have an account on Pinterest. No wonder if 85% out of its 100mln users* are women who treat this medium as an irreplaceable source of inspiration for shopping fashion and beauty products. It is an easy way to showcase brand’s universe and grow own database of followers. Pinterest strategies may vary from one luxury brand to another. Some fashion brands such as Chanel, Yves Saint Laurent or Dior keep its Pinterest profile non active, while several brands like Burberry or Bottega Veneta make a great visual guidebook for their fans. Although selling through buyable pins on Pinterest is still limited to only few U.S. retailers (Wayfair, Bloomingdale’s, DVF and Steven Alan) and 5 E-Commerce platforms (Bigcommerce, Demandware, Magento, IBM Commerce & Shopify), it is highly recommended for smaller brands to sign up for a waiting list. As of today, there are about 60 million buyable pins on Pinterest, but the potential is for 50 billion pins and they are meant to be the next logical step beyond product discovery and inspiration. What is also important for brands willing to develop Pinterest as a selling channel, the pins are designed to be mobile-friendly, and support easy checkout mechanisms like Apple Pay. Also, the merchants keep 100% of the sales so there is no commission charged by Pinterest. Latest Millward Brown study found that 93% of Pinners use Pinterest to plan purchases and 87% have bought something because of Pinterest. According to Pinterest internal research, Buyable Pins were also working well for Shopify merchants who saw double conversion rates compared with other mobile pins. Sephora, probably the most digitally advanced beauty retailer worldwide, also decided to make a visual content a crucial part of its customer activation & retention strategy. In March 2014, Sephora’s own social shopping proposal named Beauty Board was launched in the US to increase the loyalty among retailer’s customers. This combination of Pinterest & Instagram photo-heavy platform encourages Sephora customers to share and tag their "beauty looks". Users who have uploaded the looks can like other users’ photos and leave product reviews as if all Sephora customers had the opportunity to become beauty bloggers. What about selling features? Products used for make-up looks and skin care rituals can be bought with just one click. The results are impressive! According to Bridget Dolan, VP Interactive Media at Sephora, “over 55% of Beauty Board users are tagging six or more products on every photo uploaded. Mobile accessibility is also key. Over 60% of Beauty Board views are on mobile and over 45% of photos are uploaded from mobile devices.” This new approach to shopping experience proves to be very easy and customer friendly.